How we selected our list of best gaming desks? What features should you look for in a gaming desk? What different types of gaming desks are there? What are the benefits of owning a desk for gaming? What is the best height for your desk? No matter what kind of gamer you are, be it a weekend warrior or a full-fledged YouTube channel having, Twitch broadcasting gamer extraordinaire, your gaming desk can make or break your setup. You might do most of your playing in the dead of night when everyone in your house is sound asleep or you might host raging parties where your friends and neighbors all compete to see who the best beast on block happens to be. Whatever the case may be, you are going to need to level up your gaming desk to suit your needs. What can we say, it’s time for those milk crates to go. Choosing a gaming desk can seem like a simple task at first, right? You might be thinking to yourself that the desk you just saw down at the local IKEA would be perfect, or even that heavy duty, rugged workbench down at Home Depot (plywood and sawhorses anyone?). Once you start looking into what makes gaming desks so special, you’ll wonder how you ever settled for less. It’s one of those things that you just won’t understand until you’ve seen all that the best gaming desks around have to offer. And once you know what’s out there, you’ll never be able to un-know it. From the adjustable angles and heights to the special coating on the surface for mouse or keyboard movement optimization to the advanced monitor mounts and everything in between, these gifts to gaming provide the foundation upon which your entire setup rests. The benefits are so many, in fact, that it’ll take a bit of consideration on your part to make sure that you are getting the right gaming desk for your space. Getting a smaller desk might be a good idea for anyone living in a compact apartment (any fellow New Yorkers out there?) while an l-shaped or U-shaped desk might be the best option for those who have decided to dedicate an entire room to their gaming, or should we say, craft. There are even convertible styles that allow you to switch to a standing position for those longer sessions when you need a bit of a change of pace. If you are on a budget, one of your best options is the Green Forest l-shaped corner desk. The spacious setup that it provides along with the sturdy build make this sub-one-hundred-dollar desk perfect for any kind of setup. For gamers looking for nothing but the best, Clutch has everything a pro could want. While it doesn’t have all the extras that a lot gaming desks come with, the full-size mouse, tons of space, and rock-solid surface are perfect for every rig. 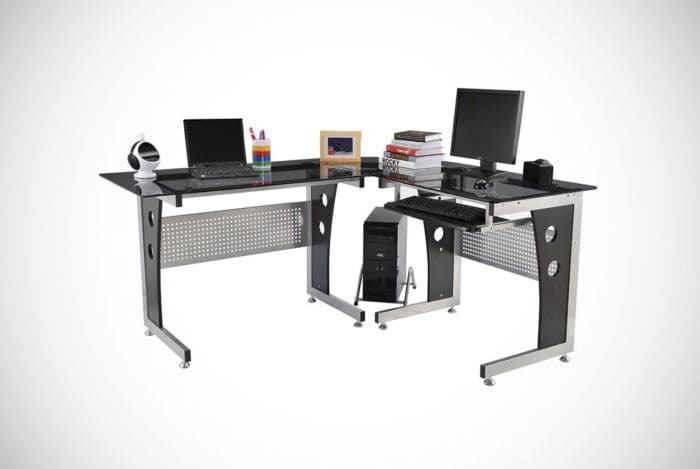 One of our favorites on this list is the Vivo Adjustable Workstation. Giving you the ability to do your gaming sitting back in your seat or standing up to in the middle of all the action. This sit/stand desk from Vivo is the ultimate in versatility. There is a reason that we have put Arena at number one on our list of best gaming desks. Well, there are several reasons, in fact. Arena is a product of Swedish design which is a fact that can be seen by its utilitarian nature, great looks, and ease-of-use. This gaming desk has a very large 14 ft² surface which can hold no fewer than three large monitors. What’s even better is that even with all of your gear on this gaming desk, there is still plenty of room left over for a massive area for mouse play. Whether you like the simplistic look, or you like to put as many things as you possibly can on top of your gaming desk the Arena won’t let you down. The all metal base and frame make this gaming desk incredibly sturdy, as does the solid desktop. For an even more substantial feel, Arozzi has opted for a mousepad which covers the entire surface of the desk. The mousepad itself has a self-adhesion quality to it, can hold a considerable amount of weight due to its 5mm thickness, and has stitched edges for increased durability and longevity. Another exciting feature of the Arena is that it is height adjustable which means you don’t have to sacrifice stability when you’re looking for the perfect desk height for your individual body size and posture. Whether you are sitting on a barstool or a top-of-the-line gaming chair you’ll be able to find the perfect line of sight to keep you in the game. As soon as you decide that this gaming desk is the one for you, all that you’ll need to do is choose one of the five colors that are available. You can decide on this black model, as well as white, green, blue, and red. Coming in at number 2, we have the gaming desk from Atlantic. There are plenty of reasons that would make someone decide on this gaming desk. If not for the slick-looking carbon fiber surface to keep your command station looking the part, the great use of space lets you game for hours on end while never feeling cramped. 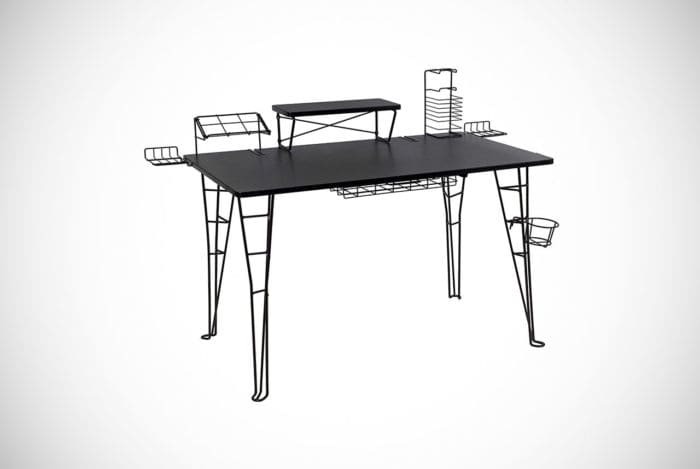 Definitely not for the minimalist, this desk is perfect for the storage hound. Do you want to keep all your controllers, game discs, speakers, headphones, and pretty much all your other odds and ends within arm’s reach? You won’t find many other gaming desks that have quite as many storage options. 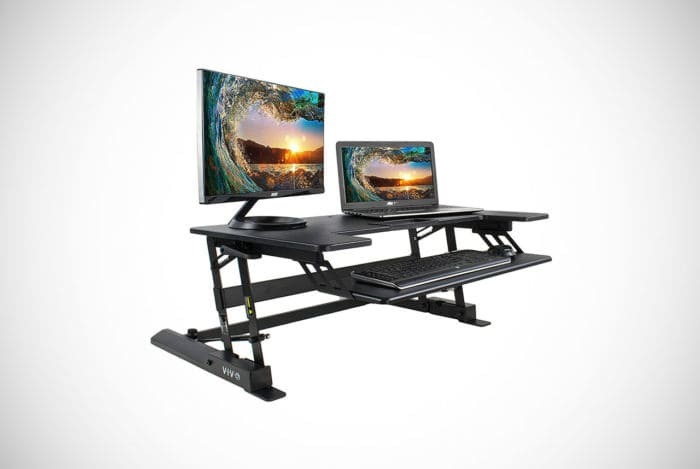 This gaming desk comes with a charging stand for your smartphone or tablet so that you can stay connected, even through the fiercest battles. There’s even a cup holder to ensure you are always refreshed and playing at your best. Another nice feature of this gaming desk from Atlantic is that it comes with a monitor stand capable of holding screens of up to 40lbs. Cable management is also a cinch with the clever surge protector bracket and cable routes. One of the best things about this desk is that despite all the bells and whistles, it still gives off a simple and sophisticated look that would fit well into any space. You could easily put this desk into an office setting, a bedroom, a living room, or your dedicated game room, and the transformation that it provides would be equally as impressive. With so many good things going for this gaming desk, we can see where we have decided to put it at number two on our list. The build quality, attention to detail, and convenience that this gaming desk provides definitely makes it a win in our books. For anyone looking to upgrade their gaming station with the desk worthy of the high-end equipment they use, Eureka R1-S Gaming Desk might just be one of the best options out there. The fairly simple, sturdy, spacious, and just plain cool, Eureka R1-S Gaming Desk will certainly make a statement without any unnecessary noise. The surface area is almost 45 inches wide by almost 25 inches deep which is more than enough room for a full-size keyboard, a large monitor or two, and plenty of mouse play. Size isn’t the only thing that this desk is going for it, though. Eureka R1-S Gaming Desk sports the stealth-like carbon fiber coating that not only looks the part but also improves mouse accuracy while at the same time hindering reflective light making it perfect for late-night gaming sessions. The RGB lighting included on this desktop also gives it a nice dose of style, and of course, can be set to any color making it possible to match your desk with your gaming rig theme. Eureka R1-S Gaming Desk isn’t just about looks. The R-shape leg design is surprisingly sturdy and wobble free, without being bulky or complicated. The idea behind the design to give you the most stability possible while still creating a minimalist look. The fact that it has a cupholder, headphone hook, racks for your controllers, and an oversized mousepad are just icing on the cake. This gaming desk is perfect for anyone looking for ample desktop space in a cool design that is as futuristic as it is functional. Whether you’re the type of gamer who likes to go all out, or you just need a space where you can keep all your gear safe, Eureka R1-S Gaming Desk will definitely hold its own. Have you ever wondered what it would be like to have a gaming desk that took after some of the most famous F1 racing cars the world has ever known? Why are we even asking that? Of course you have! Well, your wait might just be over. The Kinsal z-shaped gaming desk combines speed and style with stability and design choices proven on the racetrack to provide great balance. 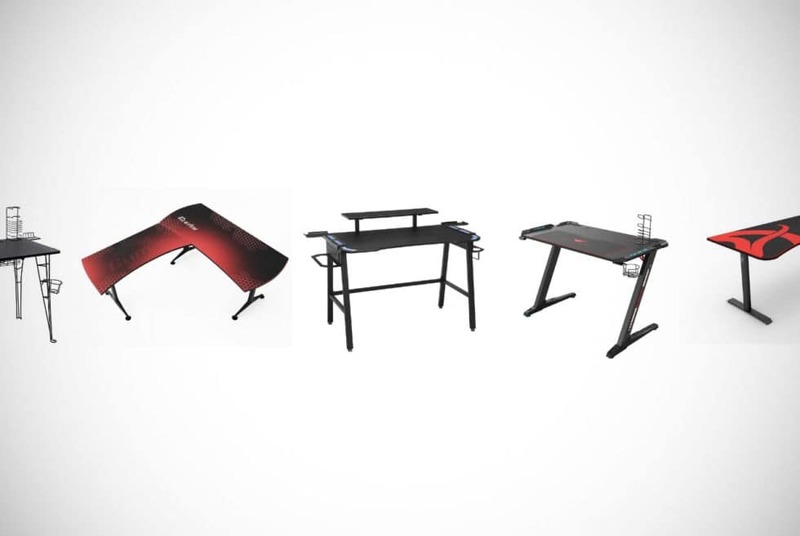 Whether you’re into racing games, shooters, or anything else, Kinsal z-shaped gaming desk will definitely supply you with the support you need for all your gear, no matter how much you have. The large 47 x 25” desktop space is more than enough for just about any kind of kit you have, be it a full-size mechanical keyboard and mouse combo, a joystick set up, or steering wheel. The ability of this desk to hold more than 500 pounds is another impressive feat, and it’s able to do that because of its high-quality steel frame and intelligent design. In fact, all of the materials used for this desk are top-of-the-line and will last very long time. All of that attention to quality comes together to create a gaming computer desk that is about as minimalistic as they come while being more stable than most. 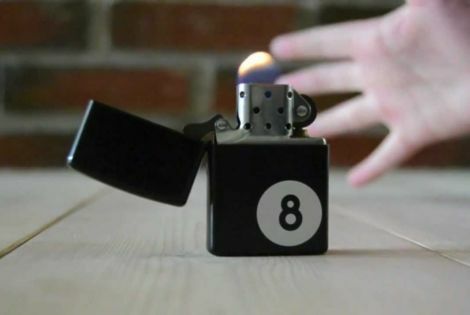 If you’re wondering if this thing wobbles? The answer would be, “only as much as your carpet is thick”. The extra features that come with this desk add to the list of things that make it a great choice for anyone looking for a gaming desk with this form factor. For one thing, it will always look its best thanks to the RGB lighting, clever cable management solutions and rear storage deck. You also won’t have to worry about your headphones getting cracked or damaged as there are convenient hooks within arm’s reach on both sides of the Kinsal z-shaped gaming desk. RESPAWN 1010 is coming in at number five on the list. It could, however, have taken a higher spot with ease. This desk has just about everything it needs going for it. From full accessory support to an elevated monitor stand to great looks and a robust build, RESPAWN 1010 could be used for long, intense gaming sessions and a sleek-looking home office equally well. The entire desk is blacked out except for a few pieces of blue trim along the sides of the desktop to give it a little flair. It’s just enough style to let you know that it’s meant to house a serious gaming rig, not too much to make you feel like you’re in a teenage gamer’s bedroom. This is a perfect desk for anybody who has a full-size gaming chair with adjustable height and who needs a little extra legroom as the surface of the desk is about 4 inches higher than the standard 30-inch height. Not every gamer feels comfortable sitting under a compact desk and having the extra space underneath can really make a long gaming session more comfortable. The fact that the monitor sits atop an elevated monitor stand also means that this desk is made for players who like to kick back and relax while getting into the game. For a 27-pound desk, RESPAWN 1010 is one of the most stable gaming desks we’ve come across in a long time. Not only can RESPAWN 1010 hold up to 200lbs. of gaming rig, theoretically allowing most of us to do a victory dance on top of the desk, but the thing doesn’t wobble at all thanks to the steel construction and top-quality hardware that it comes with. For anyone looking for a good-looking, stealth inspired, understated gaming desk that is a lot sturdier than it looks, RESPAWN 1010 is definitely one that you should check out. Another great option to consider is the Atlantic Gaming Desk PRO. Created by a company who is been making office furniture for more than 30 years, this gaming desk might surprise you at how well its manufacturers paid attention to every little detail they included. 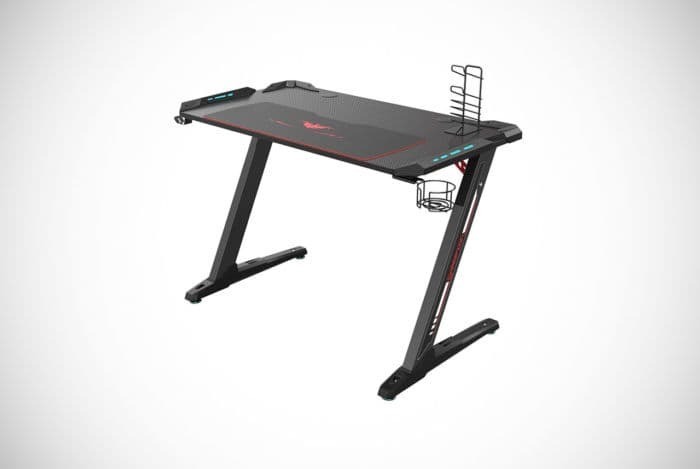 According to them, this gaming desk is made for gaming sessions spanning several hours with the intention of keeping the gamer comfortable and well-equipped. Sounds like a pretty big claim, but we definitely agree with it. Atlantic Gaming Desk PRO has all the features you could need in a desk, without including any gimmicks or extras that most players don’t even use. Another fact that shows that the company behind this one knows what they’re doing and understands their customers well, something only an experienced company can do. The build of this gaming desk is sturdy and very well thought out. There’s a slight curvature the front of the desk that lets you lean in when your gaming session is getting intense, and there are storage racks, hooks, baskets, and shelves to contain every piece of gear you own, and they are all within an arm’s reach. The built-in cable management system is simple but effective. There is a basket under the backside of the desk for the power strip which allows for a clean aesthetic that fits well with the overall appearance of this gaming desk. For all the extra features and storage space, Atlantic Gaming Desk PRO still managed to have a minimalistic feel to it thanks to its x-shaped leg design, matte black color, and carbon fiber coding on the surface of the desk. 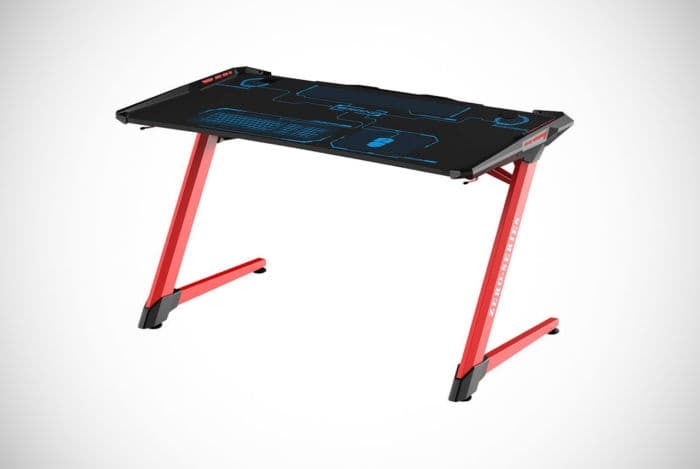 Apart from all the features that this gaming desk provides, and its top-notch build quality, Atlantic Gaming Desk PRO would be a very good option for any gamer looking for some extra leg space and an elevated monitor. With a desk surface of 35 inches off the ground and the monitor sitting even higher, taller gamers certainly appreciate this set up. The Walker Edison Soreno gaming desk is number seven on our list, but it’s number one in the L-shaped gaming desk category. This desk is just plain beautiful and would fit in just about anywhere you could think of to put it. The uncomplicated black metal frame, along with the 6 mm thick tempered glass top come together to give this desk a look unlike most other gaming desks out there. At first glance, it might come across as something you would find in a flatpack furniture store but when you get close enough to touch it you can see how quality craftsmanship and premium materials really make a difference. This computer gaming desk screams quality and simplicity, but the company behind this product is quick to let you know that durability, stability, and longevity were at the top of their priority list when putting this desk together. Whether you’re a professional looking to put together a workstation that can also serve as a battle station, or you just want a dedicated PC gaming desk it’s large and strong enough to hold all of your gear, while at the same time giving you plenty of space to feel comfortable while you play, Walker Edison Soreno will fit the bill perfectly. Apart from its attractive design and solid build, there are a lot of other reasons that you would want to go for this gaming desk as well. 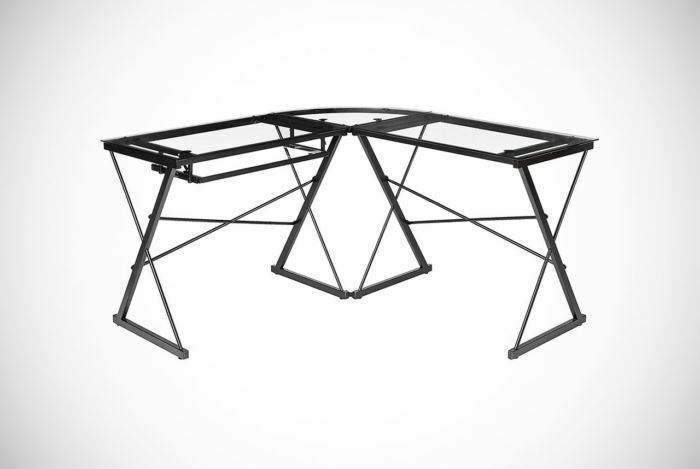 One of the main reasons that Walker Edison Soreno gets so many great reviews is that it is one of the most stable desks on the market at this price range. The tight corners and clean lines also make this desk perfect for a variety of different setups. A lot of people have taken this desk home have liked it so much, in fact, they bought a second to create a larger U-shaped desk. Another favorite of ours, the Green Forest corner gaming desk, might be the desk you’re looking for if you’ve got a lot of gear to keep track of. L-shaped desks are perfect for anyone looking to sprawl out a little bit as they give twice the desktop space compared with a conventional gaming desk. L-shaped desks allow for a lot more freedom in where you put your speakers, headphone stand, controller racks, and all the other gear that you need to save the world. Spreading things out also makes for a cleaner, and better organized appearance of your battle station which is always a good idea if you’re gaming desk happens to be in a room with high traffic. 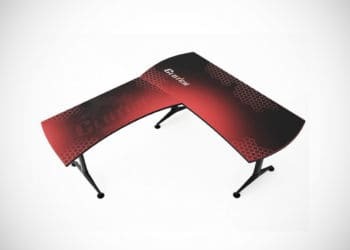 An interesting thing about the Green Forest corner gaming desk, is that unlike other corner desks this one is actually shaped like an L with one side longer than the other. The thick metal frame and glass surface separate into three individual pieces which can be moved around to fit whatever space they are being put into. Each piece can even be used as its own standalone desk, or multiple Green Forest gaming desks can be combined in multiple ways to make all sorts of interesting desk layouts. Another benefit of the sturdy frame that holds this gaming desk together is that it can take a lot of weight while still maintaining stability. In fact, once you get this desk set up and start playing on it, you’ll quickly forget that wobbliness is even a thing. No matter how long you plan to keep your desk, this computer desk from Green Forest is sure to serve you well for many years to come. Get it for its stability, its looks, its customizability, or any combination of the three. There is no shortage of L-shaped desks constructed with metal framework and glass tops, but the three-piece gaming desk Amazon basics is one of our favorites. For this style of gaming desk to work it as to have a few things going for it. The framework has to be extremely strong and durable making it possible for the desk to be virtually wobble free, the glass on top has to be thick, strong, level, and of a quality good enough to look the part, and the assembly process should be pain free. Many of the metal framed L-shaped desks available today fail one, two, for all of these tests and would have no chance making it onto a list of top choices on our site. The AmazonBasics 3-Piece gaming desk is a good example of what happens when the style of desk is done the right way. While sporting a simplistic, almost industrial design, the AmazonBasics 3-Piece gaming desk can be arranged in a variety of different ways as all three of its parts are independent of each other. 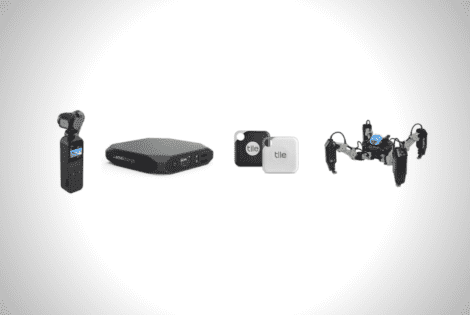 They all come together to create a very large workspace where every piece of essential gear can be accessed within a moment’s notice when needed. The desktop on each side extends to more than 50 inches wide means there is plenty of room for several large monitors to be placed side-by-side. Another plus with this gaming desk is that it is designed to be at an optimal height for ergonomics making it a very good choice for anybody who does a lot of keyboard work. Another nice touch that this selection brings to the table is the CPU stand which can be placed wherever you want. The ability to choose where your PC is located is more important than a lot of people think. Whether you want your gaming rig to set off to the side of your desk or under a specific desk surface, cable management and aesthetics are much easier to maintain when you have the freedom to choose where things go. The Clutch Ergonomic gaming desk is not for the faint of heart. To put it shortly, this gaming desk doesn’t mess around. Not only is it one of the best-looking L-shaped gaming desks we’ve seen in a long time, it’s also one of the most robust and well thought out corner desks on our list. While the Clutch Ergonomic gaming desk could theoretically be used for both gaming and home office setups, it is obviously centered on gaming which explains the mousepad that covers the entire surface of the desk. The branding and color scheme on the mousepad are also reminiscent of E-sports events and competitive matches in the world of gaming. At first glance, the Clutch Ergonomic gaming desk looks a bit like standard office table with a giant mousepad. A closer look, however, reveals design choices that are extremely clever. The long side of the L-shape, at over 65 inches, as well as the shorter desk coming in hands nearly 30 inches long, have straight backs that would normally have them sitting flush against whatever wall they were pushed up against. Common problem straight-backed gaming desks is that there is no space for cables which leads to gamers keeping their gaming table a few inches from the wall, reducing their desk’s overall stability. With the Clutch Ergonomic gaming desk, the ends of each side are curved slightly outward creating a natural space between the flat surface of the desk and the wall. The gamer-facing side of the desk is curved inward to create a more comfortable experience, as well. The Clutch Ergonomic gaming desk is a heavy-duty desk without a lot of bells and whistles, but it’s simplicity and attention to detail makes this L-shaped gaming desk a top choice for gaming pros. Where it lacks in features like headphone hanging hooks, controller stands, and cupholders that makes up for in stability, quality craftsmanship, and spaciousness. We suppose the folks over at Clutch understand that if a pro-gamer opts for this top-of-the-line gaming desk, they likely already have a headphone stand and everything else they would need to house their gear. For our final L-shaped gaming desk, we have an option for you that people can’t seem to stop talking about. Coming from long-time quality furniture makers, the HomCom Modern l-shaped gaming desk comprises every bit of the company’s expertise and attention to what makes their customers happy. This offering from HomCom is not quite as simplistic as many others on the list, but it isn’t what we’d call complex, either. There is a very strong steel frame that runs from below the desk surface to the adjustable feet that creates an extremely stable desk, an MDF board surface, as well as a drawer for a keyboard which can be placed on either side of the desk. Other than that, there aren’t too many other features that stand out apart from the included CPU cart and braces for the frame to add even more stability. In general, this gaming desk owes its popularity to the fact that it is simple and versatile, while being robust and roomy. For all the surface size that this gaming computer desk offers thanks to its design, it is also surprisingly compact. Putting this corner PC gaming desk into any type of space, including a bedroom, home office, or small office would be incredibly easy, but it looks good in larger setting too. 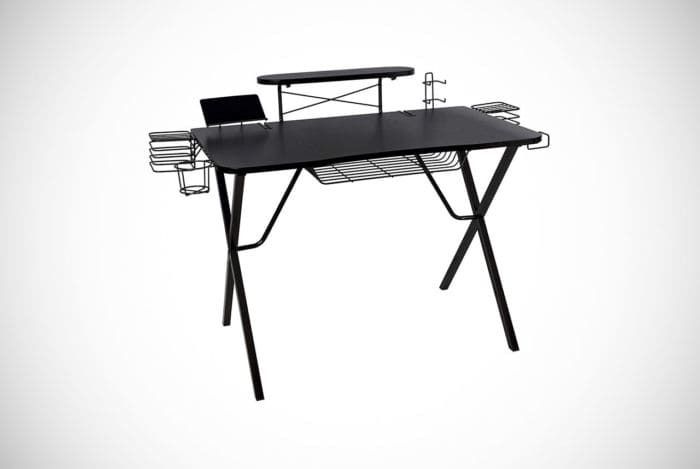 Anyone looking to maximize space without sacrificing room size would do well to consider this gaming desk from HomCom. If you’ve never considered a standing desk before, you’d be surprised at how much functionality they can add to a gaming setup. Making sure that your gaming desk is stable and large enough to hold all your gear is a great first step but adding in the capability to raise your monitor and keyboard high enough to game standing up makes a world of difference. Number twelve on our list is just plain wizardry. 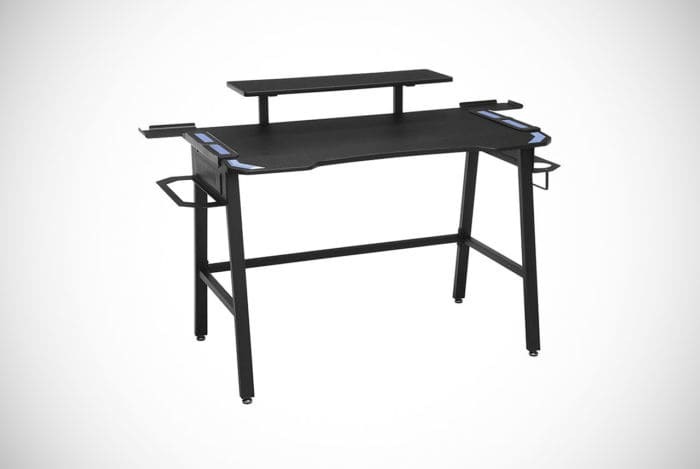 Sitting right on top of your current desk, the Vivo Adjustable Workstation is a dual platform, steel frame desk sitting on gas springs allowing you to lift almost 40lbs. of kit to any one of the eight predetermined heights with a simple pull on a lever. Gone are the days that you need to stop playing because your back starts to get sore. Now, in true warrior fashion, all you need to do to stay in the game is to raise your desk to a standing position and carry on. Health isn’t the only reason that standing desks are starting to take over the scene. Gaming while standing makes you more alert and (quite literally) faster on your toes which turns into you being more of a beast. Another reason to get the Vivo standing desk is that despite being a desk on top of another desk, it is more spacious that you might think. The top surface is large enough to hold two decently-sized monitors, and a few other odds and ends. What’s even better is that the (optionally removable) lower level of the standing desk meant for the keyboard and mouse is also plenty large making this a comfortable solution for anyone looking to get more out of their setup. Of course, the ease of installation, extra storage baskets that are included with every new desk. If you are looking for a sit/stand desk that has the potential to take your game to the next level, the last gaming desk on our list could be the one you are looking for. We’ve seen a lot of standing desks lately but this offering from FlexiSpot is one the best around, according to our extensive testing. For a gamer, the benefits of a standing desk are many. 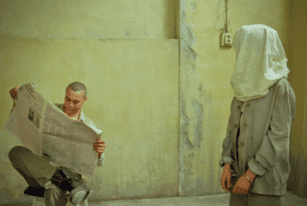 Heightened senses equal better response times, the better blood flow that comes from standing leads to better in-game bloodletting, and a better posture has a laundry list of benefits all its own. The best thing about this standing desk, is that it works in conjunction with the desk you already entrust with all your equipment. That means you won’t have to give up your headphone rack or cup holder! 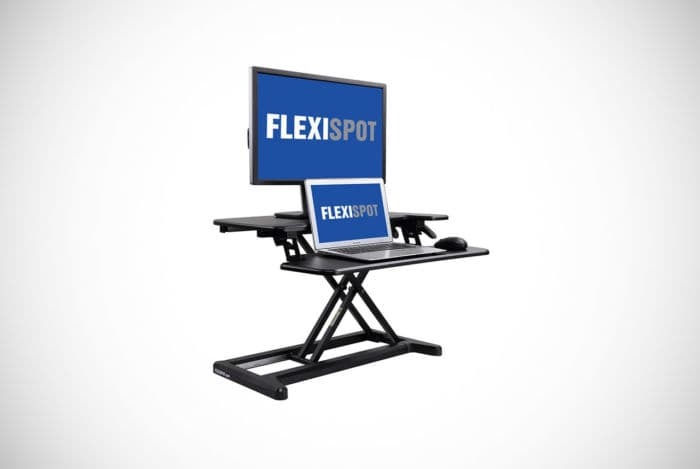 Just put the FlexiSpot standing desk on top of the existing desk and you’re good to go. 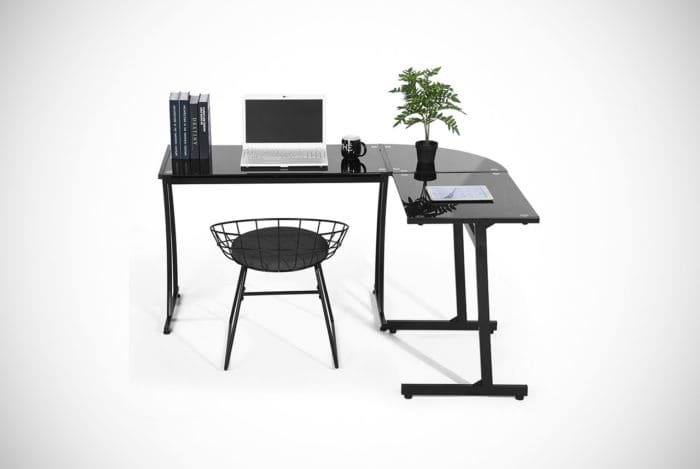 Installation couldn’t be easier, the large surface area accommodates a large amount of gear, gas-spring-powered x-pattern leg design means you can lift this desk from sitting to standing with little to no effort. As the desk raises straight up, you won’t run into any unwanted surprises when you lift it up, either. Oh yeah, did we mention that the lifting mechanism doesn’t have any set heights? You can decide which height is best for your particular needs which is a thing of beauty. Get into the game with this convertible gaming desk and take a new stance on what makes the perfect gaming desk. The process that we go through to select the best gaming available is nothing short of painstakingly tedious. We look at a broad list of features commonly found in today’s best gaming desks. We investigate every gaming desk manufacturer that matters within the industry for details on topics such as warranty information, customer experience policies, and much more. The first thing that we look for is the number of features that the desk has. Some have many and others just a few, but it is in how those features are implemented that puts them into the territory of being great or just plain sad. If you’ve ever sprung for a motorized, convertible gaming desk that simply stopped working after a few short months and then found nothing but the sounds of crickets on the line when trying to contact the customer support, you would know how important it is to focus on quality over shiny features. That’s not to say that you should decide on utter simplicity, though. It just means you’ve got to be sure that the features you get will do what they promise. Some gaming desks come with so many features it’s hard to know exactly which are for you and which will just get in your way. Are you looking for built-in speaker stands, cable management options, modular setups that allow for rearranging and expanding, keyboard drawers, or cupholders? You’ll find countless lists of ‘special features’ on offer and we see it as our duty to tell you whether these features are game-changers or nothing more than gimmicks to sell a product. Another major focus for us when testing out gaming desks is how effective the design choices from the manufacturers are. 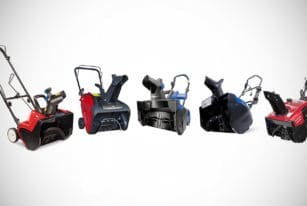 There are various styles to choose from, and although many tend to look quite similar to others on the market, differences in height, stability, measurements, and much more come into play when deciding which are the most effective at what they promise to do. The only gaming desks that you will see on this list are options that have been tried and tested by gamers just like you. They come highly reviewed, in general, and we have also given each one on the list our Men’s Gear stamp of approval. So, you know there are many features available and you are aware that not all of them are necessary, or even that great to begin with. How do you know how to narrow the list down to find the exact feature set that’s going to bring your gaming into another level? Fortunately for you, we’ve come up with a quick and dirty guide to help with the decision-making process. When it comes to gaming desks, stability is something that you should never overlook. Gaming setups have many different parts and peripherals and can be quite heavy. Making sure that your gaming desk sturdy enough to withstand the load that you intend to put on it means you aren’t going to end up with a wobbly desk that feels as if it’s going to collapse at any given moment. Product descriptions won’t often tell you how stable a desk is because there is no universally accepted measure for stability other than an in person shake test. We use data from actual gamers to ensure that every gaming desk on our list passes the aforementioned stability tests. Once you have the stability issue figured out, it’s time to look at whether you need to gaming desk with specialized mounts for your monitor(s) and speakers or if you simply need a tabletop style gaming desk. If mounts are something that you need, opting for mounts with sturdy build quality makes a huge difference in the end product. Nobody wants to see their monitors shaking all over the place as soon as they sit down at the gaming desk. Another feature that mounts often come with is angle and height adjustability which is certainly a good feature for anyone particular about their viewing angles. Size is another important factor, although it is one of the easiest to figure out. You’ll want to get ballpark measurements for the desk that you have in mind which you can use to make comparisons with the options that you’re sorting through. For room size might be a deciding factor for the size of gaming desk you choose, the amount of equipment that you plan on including in your gaming setup also matters a great deal. Are you going to put your gaming tower into a cabinet built into the gaming desk or you going to put it on the floor? Are you going to need separate drawers and compartments to keep your gear hidden away or do you want everything on display? Once you’ve taken all of these things into consideration, remember that you want enough space to game comfortably so as not to feel cramped and stressed while you play. Storage unique features are also something that you want to look at, and every different gaming desk and gaming desk manufacturer is known for its own signature special features. Some come with unique cable management systems, others with modularity built into their designs making it easy to expand and contract your set up, some have heights and angle adjustments baked right in, and some of the higher end options have unique materials and surface types that add to precision mouse movements and stability. One decision to make when it comes to choosing a gaming desk is what style you would like. 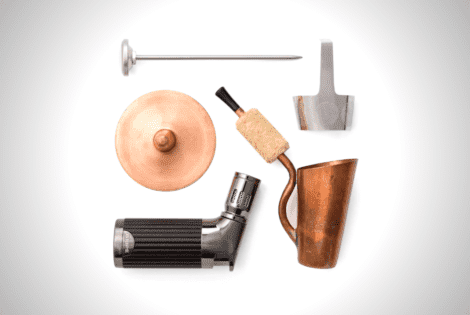 There are many styles to choose from and each one comes with its own set of pros and cons, depending on how you plan to use it. 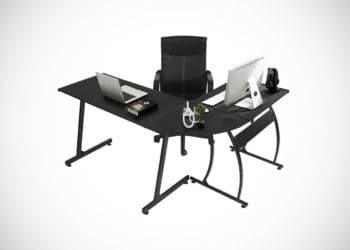 Some of the most popular options available today are z-shaped, l-shaped, u-shaped, wooden, corner, arena-style, convertor, and height adjustable desks. While there are a few other takes on gaming desk styles out there, these are by far the most widely used. 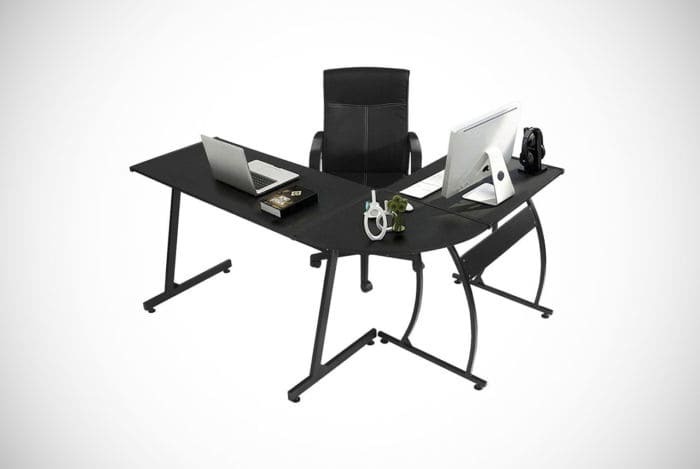 The z-shaped gaming desk is very popular due to its sleek design. From a side view, the leg design on these gaming desks form a z pattern with the desktop and feet of the desk providing a minimalist design that is both functional and great to look at. These types of desks can be outfitted with a number of attachments like a side platform for your PC, a cup holder, a keyboard drawer, a monitor mount, and more, but many who choose this style appreciate the simplicity that comes with them. 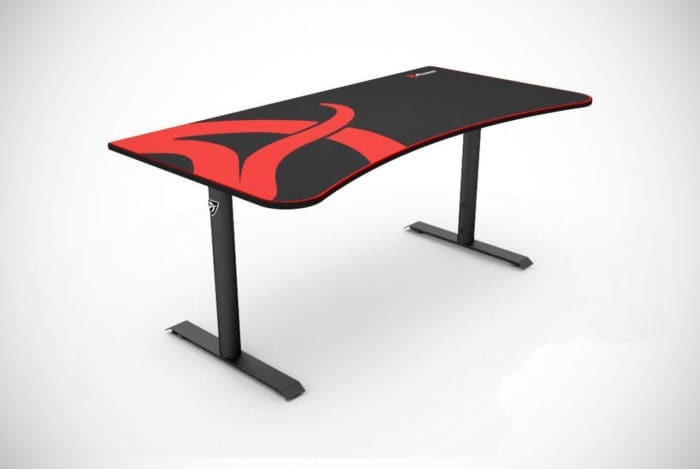 A similar desk style to the z-shaped design is the classic arena-style gaming desk which essentially the same thing with legs going straight down and a curvature at the front of the desktop allowing the player to stay close to the action. While they are all often the same basic shape, arena gaming desks come in different sizes to suit different needs. Simplicity aside, gamers with a lot of gear generally tend to lean more towards larger, heavier options to provide themselves with the storage space they require as well as the stability that comes with them. Of course, the extra elbowroom has got to be a factor, too. L-shaped and corner desks, for example, could be seen as two desks in one. Because of their l shape, a monitor can be placed on either side or directly in the center. The u-shaped design is great too because it makes you feel like you are in a cockpit. With this design, the monitor goes right in the middle and all the peripherals spread to the sides. For the ultimate in stability, heavy wooden desks are popular too. These come in a variety of sizes and shapes, but the wooden desks designed for gaming are built to house all the usual equipment that comes with a proper gaming setup. Sometimes, functionality is more important and that’s where convertor desks, modular designs, and height adjustable desks come into play. With these, you can put together a gaming station that not only fits the space and equipment it is intended for but also the way you intend to use it. At this point, we should address the elephant in the room. Do you really need a gaming desk? Many people believe that any product with the word ‘gaming’ attached to its name is going to come with a fair amount of hype and a healthy price hike as well. Luckily, that reputation for gaming gear doesn’t really hold much water when it comes to gaming desks. Gaming desks are designed more for their features than anything else and that’s what makes them great for their intended purpose. One benefit that you will quickly notice is that these desks are designed for the PC, the monitor, the keyboard and mouse, and all the other peripherals associated with gaming. That means you’ll never have to worry about having too little space for you gear. That also means you’re not too likely to spill coffee on your $150 mechanical keyboard because you didn’t have anywhere to put it due to all the unnecessary clutter on your desk. Apart from having plenty of room for all your gear, gaming desks also have clever ways to manage all those pesky cables that end up tangled up everywhere. Bad cable management can wreak havoc on the appearance of your setup, so having a desk that helps you keep the cable situation under control is always a good thing. The fact gaming desks sit at just the right height also makes for healthier (a fact we go into in more detail further down) gameplay. Not only do the right ergonomics help with posture, stress, eyestrain, and repetitive stress reduction, they also improve the overall comfort levels making you a better gamer. Speaking of comfort, height, angle, and size aren’t the only things that improve your gaming experience, either. Gaming desks come with many features that make it easier to protect your coveted gear and modify your experience as you see fit. Determining the best desk height for your setup is helpful for many reasons. Having the correct desk height is not only more comfortable and conducive to better gameplay, but it is also connected to your health. Health may not be one of the first things that comes to mind when thinking about gaming and gaming desks, but it is a factor that should never be ignored. Especially seeing as how gamers tend to sit in front of their computers for hours on end. To maintain your health and comfort, being sure that your eye levels and desk height are at optimal settings is crucial. Ensuring that your set up encourages proper ergonomics will reduce problems relating to the neck, the back, the arms and joints, as well as tendon related problems and repetitive stress issues. Finding the perfect height balance for your gaming desk ultimately comes down to your posture while sitting at the desk. Considering your keyboard, your hands should be able to float on top of the keys and your forearms should be level with the floor, give or take a few degrees for comfort. Excessive forearm and wrist angles can easily lead to serious problems. Likewise, reaching up or down with your shoulders for long periods of time can be detrimental to your shoulders, neck, upper back, and overall posture. How your monitor is positioned on the desk is also a key piece of the puzzle. While sitting straight back in your chair with your feet flat on the floor, the top of the monitor should be at about eye level. To put these concepts to numbers, a standard office desk and chair set up for an average height person puts the desk height somewhere between 28 and 30 inches tall. Of course, that’s just an average taken from standard equipment and will vary quite a bit depending on what type of chair you have and where you get your gaming desk. If you are unsure about how high your gaming desk should be, it could be a good idea to get a gaming desk with adjustable height so that you can experiment until you find the perfect desk height. No matter what kind of gaming desk you are looking for, you can definitely find one that’s the best for your needs by looking at what each one provides. As you can see from our buying guide, there is no simple answer to which desk is perfect for each person as every desk comes with its own set of features and unique attributes. Sometimes it comes down to the amount of gear you have, sometimes it’s all about looks, and sometimes you’re looking for an option that looks as good as it is functional. You also might be looking for a gaming desk to meet very specific needs, like a standing desk or one with just the right amount of legroom. The trick is to figure out how you want your command station to look and what kinds of features you need before you start to shop around. That way, choosing between a modular design, an l-shaped desk, a sit/stand desk, or a competition-style PC gaming desk gets a lot easier. You also have to know whether you want racks and storage options, or if you want to go with a more minimalist approach. All the desks here on our list of the 13 best computer gaming desks available now are reviewed very highly which means you could choose any one of them and be satisfied with your purchase. As long as the gaming desk that you choose has the features you want, of course. Give each one a look and decide which of the desks from out list is best for you. 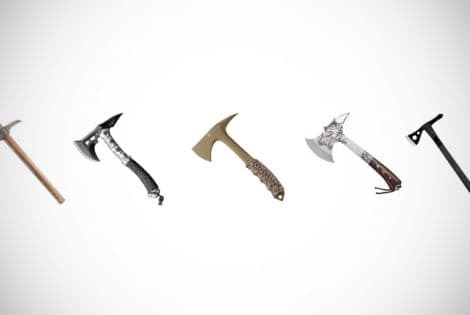 Forget about your rusty hatchet and choose a tactical tomahawk instead. Get a slice of the action with one of the best tactical tomahawks on our buyer guide, today!